You may have forgotten that long before the advancement in hidden deck fasteners - that install from the edge of a board - there were fastener tracks. Under deck fasteners like this one shown are simple in concept but have proven their worth and durability over many years now. There are slight variations from one manufacturer to the next but they hold the decking more securely then some of the other side oriented hidden wood deck fasteners. I will explain the different types of systems that attach boards from underneath and then it's up to you which one you think is best. Right from the start however you must realize that these concealed fastening systems do require that you reach underneath the decking in the joist area in order to drive in the screws. If you know that is not desirable for you then you should consider the side mounted clips. In the end you have a flawless deck surface and boards that are really secured well to the joists. This category of concealed deck fasteners are screwed to the side each joist - or from the top -and then the decking boards are toe-nail screwed in place. Each manufacturer has a slight variation to the method but the concept remains much the same. You need room to get your arm in underneath and this is really the only negative to this kind of hidden fastener. If you have a large deck to build you may not feel like doing that. Cost is about $1.05 to $1.30/sqft. Cost is about $1.20/sqft or more if stainless steel is used. These remaining concealed deck fasteners are ingenious. In order to devise a connnector other than a track requires some very creative thinking and these two candidates are great examples. The Invisifast fasteners are like right angle bar but cut into small 1" long pieces. And they are made of a clear plastic so they are aptly named as they are practically invisible. But the downside to this solution in my opinion is the extra work involved to install them. They certainly will give you the screw less top deck surface you are looking for but you will have to earn it. Cost is between $0.75 and $1.10/sqft depening if you choose stainless steel screws. Wow! That's what I think when I see the thinking that went into this product. 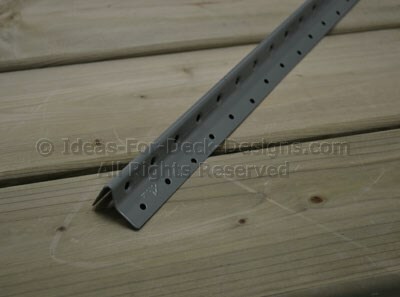 The FastenMaster IQ is a hidden decking fastener that is not side mount and not a track system either. You screw it onto the top of a joist and then the next fastener screws to the underside of the other board. You can then slide them together and interlock them. It's actually quite brilliant. But a little more costly. What Type of Under Deck Fasteners Will You Choose? You can see that a "nail-less" or "screw-less" deck is more than possible. The selection of under deck fasteners for decks is large but you should be in a good position to make the right choice in terms of cost, materials and the style you are looking for.